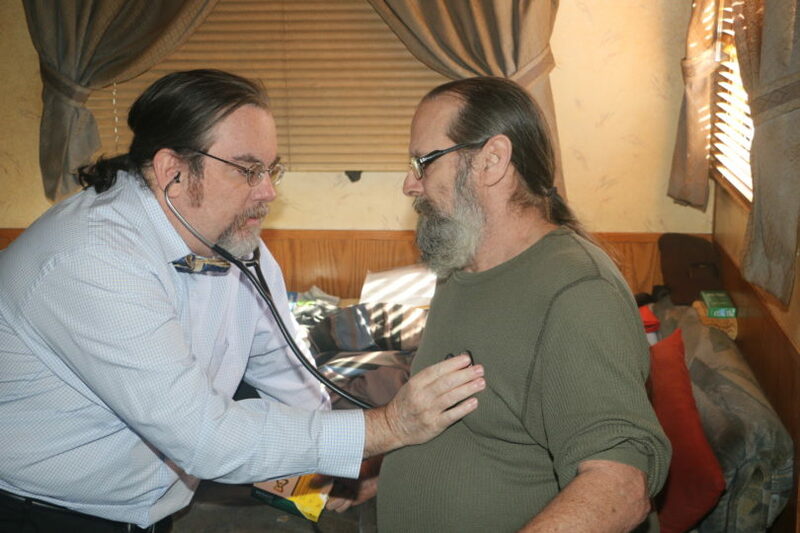 Dr. Don Scott cares for a patient during a home visit. Each week the Athens Community Council on Aging and its 200 volunteers deliver over 1,300 meals to homebound adults in Clarke and Barrow counties through the Meals on Wheels program. Some of the 300-plus clients are older adults who have difficulty getting out, while others suffer from disabilities that prevent them from leaving home. This service not only provides individuals with meals but serves as a safety check. Many of ACCA’s Meals on Wheels clients are at an increased risk for medical emergencies, falls and other accidents, and it is often difficult for them to get to doctor appointments. Dr. Don Scott was quick to recognize this growing problem after he began volunteering with the ACCA. Scott, one of the few practicing geriatric physicians in the Athens area, is an Augusta University/ University of Georgia Medical Partnership faculty member. He reached out to Eve Anthony, chief executive officer of the ACCA, to see how he could help. “He immediately recognized the challenges we face as an organization for those clients who are experiencing health and wellness issues, and the numerous Meals on Wheels clients who may not have a primary care provider,” said Anthony. As the campus director of geriatrics and palliative care, Scott oversees the AU/UGA Medical Partnership Internal Medicine Residency Program’s geriatrics rotation in partnership with St. Mary’s Health Care System. In 2016, the residency program collaborated with the ACCA to make home visits to the Athens-area Meals on Wheels clients part of their geriatrics rotation. 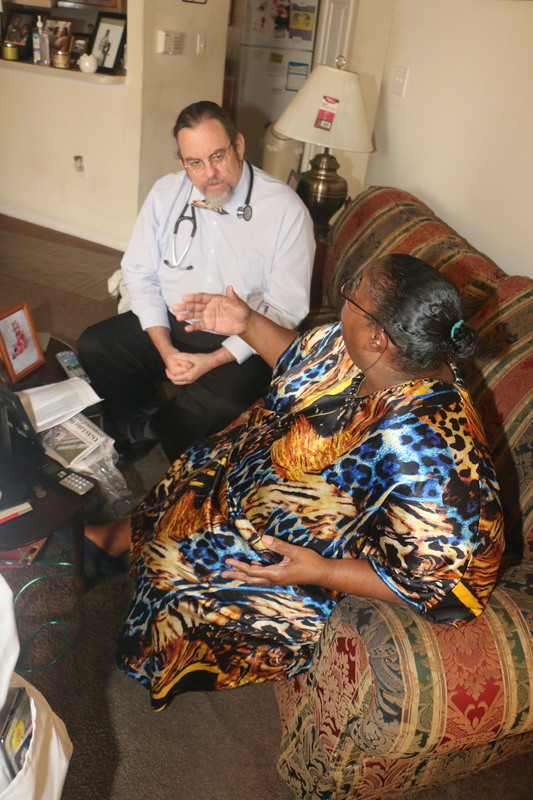 Dr. Don Scott discusses health issues with a Meals on Wheels recipient. The ACCA recommends clients to Scott’s team based on the highest level of need. So far, the internal medicine residents and Scott have visited over 30 homebound individuals in the Athens area, totaling more than $5,000 of free care. Those numbers are continuing to grow. From adjusting their blood pressure medication to organizing their prescription drugs to providing home safety visits for those with mental health issues, Scott and his team see a variety of issues. One of Scott’s favorite stories is about a woman who needed the brakes repaired on her rollator. He made ACCA aware of the situation and they worked with a local bike shop to make that repair. Another visit led to helping a woman get her dog to a veterinarian. Scott is currently working with the ACCA to assist in restoring water to a patient who has no functioning plumbing. “Having Dr. Scott and the residents in the client’s home doing in-depth assessments gives us access to information on that particular client’s needs that we may not have,” Anthony said. The residents benefit from the program as well by gaining an increased awareness of the day-to-day challenges these patients face. Going into homes, rather than seeing patients only in an office or hospital, gives residents a new perspective and allows them to develop better patient care plans. In recognition of his hard work, Scott and the AU/UGA Internal Medicine Residency Program were awarded the 2018 ACCA’s Community Partner of the Year award. As an agency, the ACCA acknowledges it cannot meet the Athens community’s needs alone and recognizes they can do more when aligning their mission with others who share those same goals.